I've been very slowly working on painting our upstairs bedroom. Slow... yes... it's been like 6 weeks since I started the project. Ya know it all started when I simply wanted to hang the new Ikea panel drapes. Next thing I knew I was patching a hole... then another... then another until the room was all spotty. That's ok though, the room needed a paint job anyway. I really, really wanted to do a quick paint job but DH seemed to continue to prod me into doing it in the more thorough manner that he's used to seeing me do my projects. "Ok, I'll remove the paint from the fixtures and the hinges." Honestly, I was already armed with a can of spray paint that I figured would just fine. 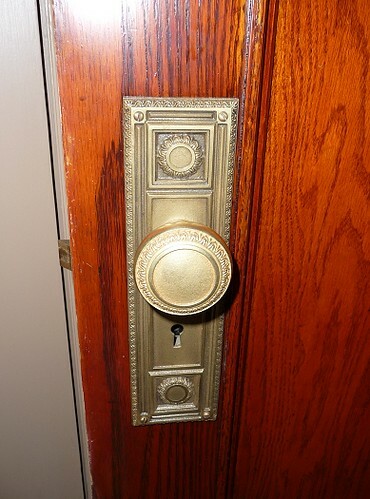 It had been a while since I removed paint from the brass hardware and I wondered if there was a better product or a better way to get the job done. I really hate paint remover; it's so messy! Googling brought me to a very simple solution to try. 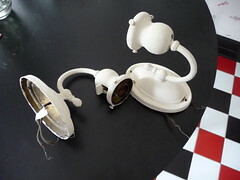 For this paint removal trial I would need a large pot that I won't ever use for cooking again and a lot of baking soda. I got a big pot from the thrift store for under $10 and proceeded to embark upon this experiment. 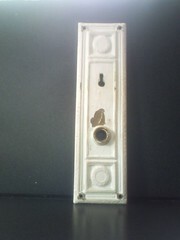 So I needed 4 tablespoons of baking soda per 1 quart of water and of course the painted hardware. 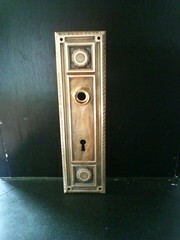 I decided to try it out on one of the brass door plates; probably not the best thing to try it out on, but it was handy. 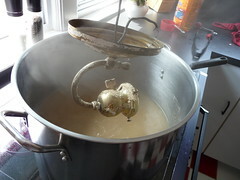 I placed the brass plate in the pot with the water and baking soda and boiled it for 40 minutes. Yes, I said boiled it! The results were amazing as the paint really did slide right off. 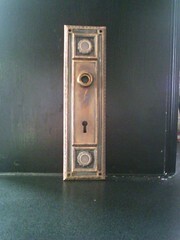 After rinsing the piece it had a patina look to it that I hoped would come off. 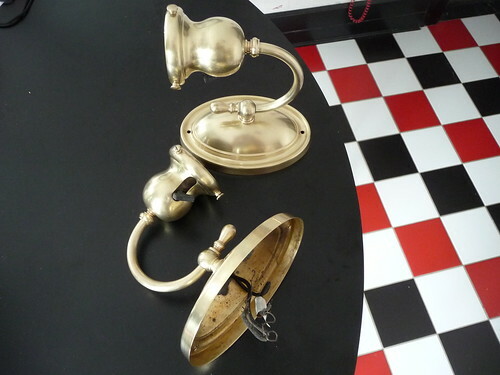 I used some Bar Keeper's Friend and a toothbrush and scrubbed the brass. It immediately revealed the original golden hue. I let it dry, polished it up a bit, then sprayed it with a clear lacquer finish to protect the surface. WOW. So the pictures below doesn't do it justice since it wasn't totally polished and since I'd just broken my other camera. Check out the pictures of the sconces though! This is the finished hardware. 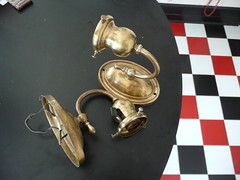 These brass pieces are all from 1914 when the house was constructed.